Experience: I have over 25 yrs. experience on all makes and models. Factory trained for Subaru and Nissan. Hi there! Do the brake lights come on when you step on the brakes? WEll, it is hard to say what is wrong without a little testing. This is why I am asking about the brake lights. It is activated by the brake light switch. If the switch is working the lights will come on. If not, then a simple fuse may resolve the issue for you. I do need the info I asked for to help you determine what the problem is. Please let me know if the brake lights are working or not. Ok, we have a couple of fuses to check that affect the shifter,and not the brake light. 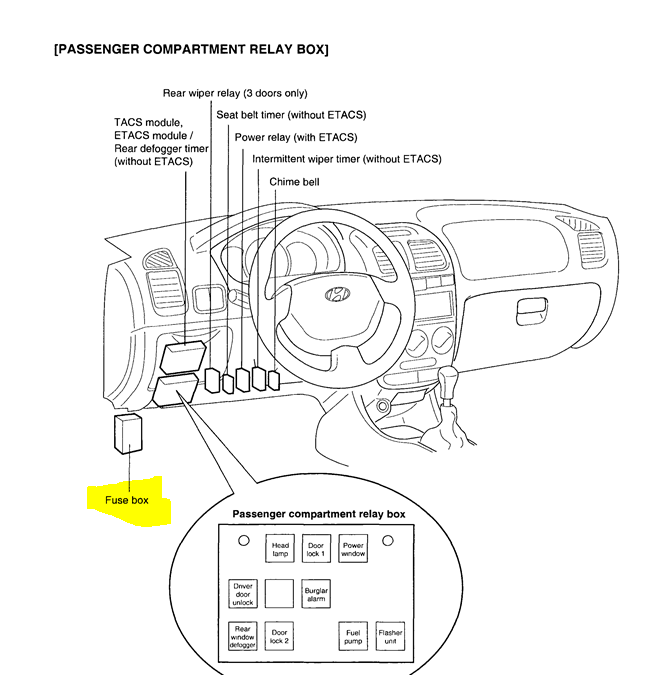 These fuses are located inside the car. Fuse #1 and fuse #14. Fuse #14 is the fuse that provides power to the a/t shift and key lock control module. Fuse #1 also provides a source of power for the module. Check these fuses and let me know. 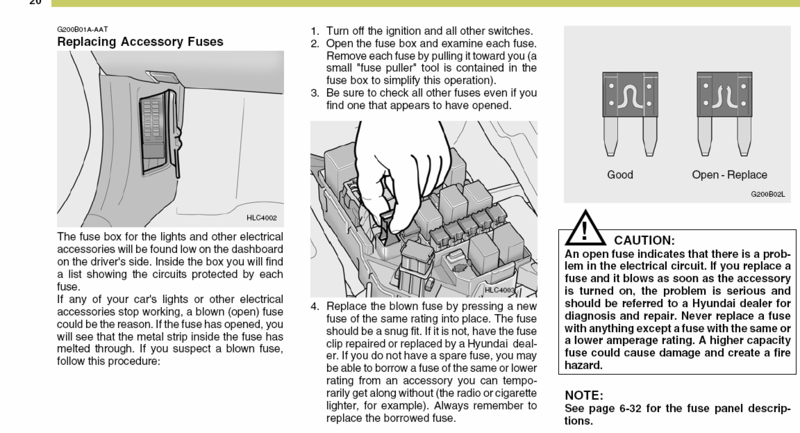 If your fuse box is not numbered, let me know and I will try to provide their location on the fuse box. Well, it has to be diagnosed. I can't just say to you the park neutral position switch needs to be replaced without checking all the parts and pieces. There are several different components to the shifter that need to be looked at. Here is what I suggest will be the best method for you. 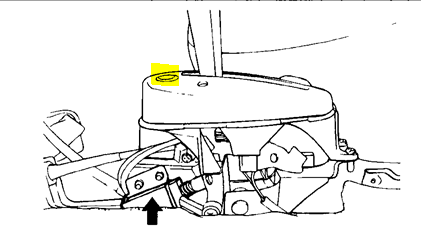 On the cover of the shifter there is a small plastic piece that can be removed. Remove this piece, then take a small screwdriver or bic pen cap and push down. 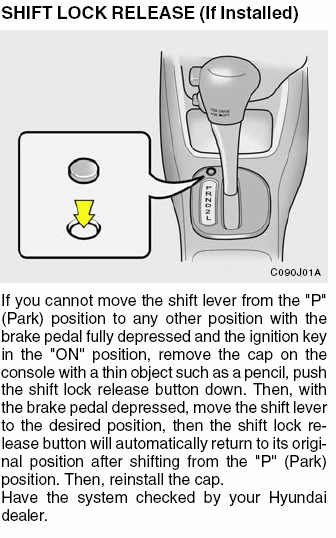 At the same time pull the shift lever and it should come out of park. You can drive the car this way and have it diagnosed and repaired. Since you are uncertain how to check the fuses, then I suspect giving you the tech info won't really be doing you any favors. This should however allow you to get the car out of park so you can continue to drive it until you can have it looked at. Here is a diagram and the location of the shift overide is highlighted. Ok, please reply and let me know how you make out. Are you saying you don't have this as shown here? I have to get my sone from school. Please reply and I will respond as soon as I am back! You are looking at the fuse amp ratings. The fuse #s should be on the cover. I suspect what may have happened is things just got out of sync. Once you got it out of park and back in, things were probably back into sync and that is why it is now working normally. You are very welcome! If you need further assistance sometime just let me know! Can't get my car to shift into park. 2014 hyandai sonata.